As one Firaxis rep put it during my hands-on session last week, XCOM 2 is “about aliens and death”. Anyone familiar with Enemy Unknown, or aware of its reputation, knows that squad losses hit hard. Whether it’s because your heavy is named after your mum, or because you grew reliant on the prowess of your sniper (who happens to be named after your goldfish), that overwhelming sense of loss is what defined XCOM. Enemy Unknown and its expansion, Enemy Within, were both fine story generators, as much a result of the player’s emotional investment as crafty design. XCOM 2 focuses on those emergent aspects even more, with procedurally generated maps and greater character customisation. The latter means you can actually make your mum look a bit more like your mum. Here’s the thing, though: during my two-hours with XCOM 2, I didn’t spend time customising my character’s cosmetic appearances, nor did I name them after loved ones or, perhaps more sensibly, the singer from Nickelback. It’s hard to establish that kind of investment during a brief hands-on session, but I still found it incredibly tense. 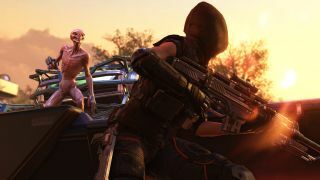 Firaxis has implemented a few significant changes, but XCOM 2 is very much a sequel to Enemy Unknown, only this time it’s built to last forever. I completed one Grey Ops mission set in New India. My objective was to hack into a hidden resistance computer which, as it turned out, was ‘hidden’ in a tumble down shack in a bleak, grown-over urban environment. Said shack was surrounded by goons and giant reptilians known as Vipers. In XCOM 2, squads are concealed by default at the beginning of every match, and setting up for an attack is relatively stress free. So long as the enemy’s line of sight isn’t breached (their line of sight is marked by red shaded boxes on the grid) and no weapons are fired, the squad will remain hidden for as long as it takes to set up an effective offence. Combat is still determined by percentages. This Viper is doomed. It’s stress free, so long as there’s no time limit: I only had eight turns before the network would shut me out of the resistance computer. My squad consisted of the two new classes – the Specialist and Ranger – alongside a Grenadier, Rookie and the Sharpshooter, which is a replacement for Enemy Unknown’s Sniper class. Positioning the latter behind cover, I landed a shot on a Viper and prepared for all hell to break loose. Although my Sharpshooter had announced her arrival, the rest of my squad remained concealed until they fired – all the better for taking out the remaining Advent soldiers. The new classes are interesting. My Ranger was equipped with an assault rifle but he’s more adept in close quarters situations, better to wield the heavy duty machete sword he hides down his pants. Meanwhile, the Specialist has a drone, or Gremlin, which can be used for combat or support purposes. Combat involves hacking any nearby robotic enemies or sentries, and support is mainly medic abilities – though who knows what hides on the upper echelons of that upgrade path. Even then, it’s more about the interplay between your squad members’ strengths and weaknesses, and having a Sharpshooter stand in Overwatch while your close-quarter combatant(s) creep around a nearby building towards the objective is just one of dozens of tactics you could execute. Overwatch works differently in XCOM 2, by the way: whereas previously all applicable squad members fired on the same emerging enemy simultaneously, now it happens sequentially. That means you won’t find three well-equipped squad members firing foolishly at the same low-level grunt. The old way was silly, and many players considered it a bug. In terms of quality-of-life improvements, this is the most substantial. That all sounds great, less stressful even, so how is XCOM 2 more stressful? Weirdly enough, the loot system caused me a lot of grief. Loot drops at random on the battlefield, but you’ll need to snap it up quickly as it only sticks around for a limited number of rounds. I didn’t realise this until I started to move my Rookie over to the glinting yellow collectible only to be intercepted by an alien. By the time I’d dealt with it, the loot was gone. In this way, loot has the potential to utterly ruin your carefully laid plans if you get too greedy – Think Spelunky and you’re on the right track. Hacking can offer rewards, but it can also be disastrous. If you do pick it up you’re rewarded in the form of weapon upgrades and PCMs, or Personal Combat Sims, which offer permanent buffs to any one of your squad members (such as +2 mobility, +1 health points etc). You can also gain perks with hacking, but like combat, this is dependent on a chance percentage, which is itself determined by the hacker’s stats. Failing a hack can also have dire consequences. After a jaunt through the tutorial, a Grey Ops mission and an aborted story mission, I’m confident XCOM 2 bears all the strengths of its predecessors, with the added benefit of near infinite replayability. Firaxis is also promising access to 50gb worth of assets for XCOM 2 modders, so they’re clearly banking on this instalment having a long tail. It’s definitely more of the same, but small enhancements like loot and concealment have large implications, making it an XCOM game you can play forever.